This chapter is about a picture which I talked about two weeks ago in a post called ‘Art Unsigned’. I have continued to research the watercolour and have found new facts and some interesting proofs which arise in regards to the new information and the image itself. 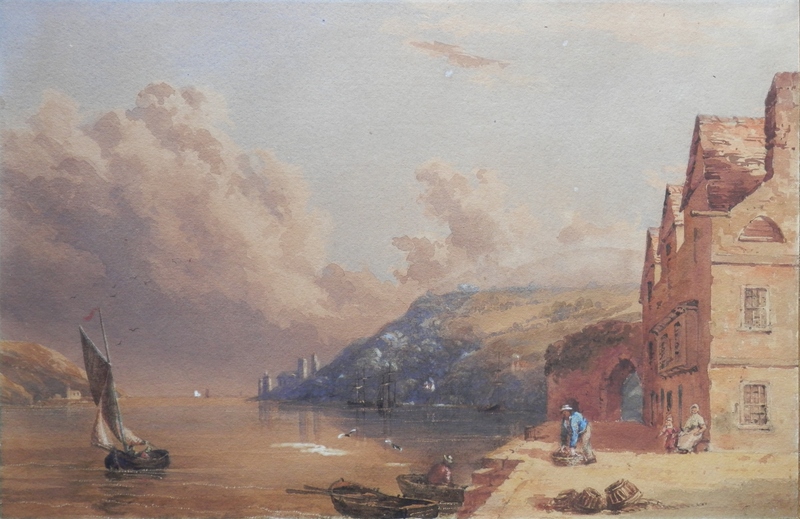 I identified this watercolour as #DartmouthHarbour but it is in fact a short way down the River Dart from the harbour and is actually called #Bayard’sCove. Bayard’s Cove is Dartmouth’s oldest wharf. 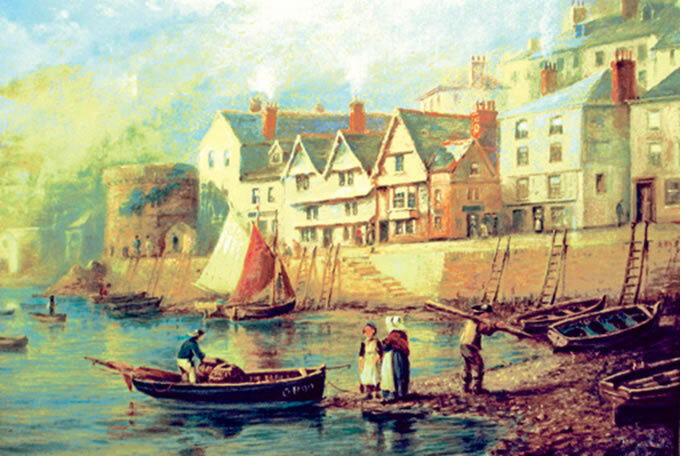 It’s cobbled quayside is where the Mayflower and the Speedwell moored in 1620 as the Pilgrim Fathers made their way to the New World. So, I have identified the place more exactly. I also estimated the date of this painting to be 1860 and this I did from the tower of St Petrox Church. It is one of those distant towers at the mouth of the river. The tower in my picture does not have a steeple on top of the tower. The steeple was removed around 1855 and thus my estimate for the images age. My readings tell me that the tower did not have a steeple when originally built and was a crenellated like a castle tower. The steeple can be seen in Samuel and Nathaniel Buck’s etching of 1765. My picture is certainly not earlier than that. The other age proof comes from the right hand side of the painting. We see the side of the three story building – windows on each floor and an arched access above them with a chimney rising just to the right above. All the images I have found of this site have an extension coming off the end of the building towards us the viewer as seen in the painting by W H Way -1890. It is set back a foot or less from the corner of the building so the windows and arch are not there and the chimney has also been moved to the right down the side of the building. It means that my estimate is possibly correct and that my painting is the earliest image of Bayard’s Cove I have yet come across. This entry was posted in Watercolour paintings and tagged Bayard's Cove, Dartmouth Castle, Dartmouth harbour, pier, River Dart, row boat, ships, St Petrox. Bookmark the permalink.